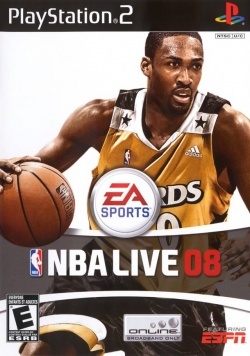 Game description: NBA Live 08 introduces hot spots, where real NBA shot data is used to illuminate the locations on the floor where your players are most effective. Quickstrike Ballhandling, a new intuitive gameplay mechanic, gives you the direct responsiveness you need to perform a full repertoire of ankle-breaking ball-handling moves that let you dominate on the perimeter. Couple this with all-new signature go-to moves that capture the essence of the NBA's best, and you can now play the game on a console like you see it from the stands. This page was last edited on 5 February 2017, at 18:37.